Family owned and operated for over 30 years, Skylite West Banquets is a great place for your next event. Located in Berwyn, Illinois, Skylite West Banquets offers personal customer service, great food, and a beautiful atmosphere. We provide the perfect atmosphere accommodating 50 to 400 guests for any occasion. We would love to be part of your next celebration whether be it weddings, bridal showers, baby showers, retirement party, graduations, luncheons, company gatherings, holiday parties, proms, reunions or any social event! 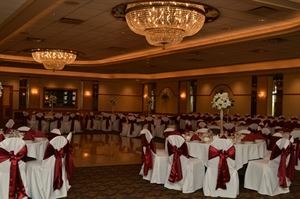 Our main ballroom is located through our main lobby. This spacious room features a marble dance floor in the centered in the room, two full service bars, a private bridal suite, and elegant crystal chandeliers. This room can accommodate up to 350 guests. Our elegant banquet room is located through its own private entrance. This room features a full service bar, marble dance floor, and beautiful crystal chandeliers. This room can accommodate up to 100 guests. Our food is prepared fresh by our in house chef to your specifications. Your menu selections can be served plated, family style, or buffet. Wedding Package Includes: • A champagne toast for all guests • Your choice of a wedding cake • Four hour premium open bar • Skirted head table • White linen table cloths • Your choice of colored napkins • Our beautiful centerpieces compliment all guest tables • Private bridal room Please visit our website for complete package details. Breakfast Buffet Selections: • Scrambled Eggs • Denver Scrambled • French Toast • Bacon • Sausage/Turkey sausage • Croissants or Toast • Coffee, Tea, & Milk included We also offer a continental breakfast that is great for gatherings such as meetings. This includes assorted bagels, muffins, sweet rolls, coffee, tea, juice and milk. Please visit our website for complete menu details. Family Style Dinner Package Includes: • First Course - Homemade soup • Second Course - Fresh tossed garden salad with choice of 3 dressings • Third Course - Pasta with homemade meat or marinara sauce (mostaccoli or rotini) • Soups - choose one • Entrees - choose two • Dessert - choose one ice cream flavor. Please visit our website for complete menu details. Plated Lunch & Dinner Package Offers: Plated menu includes main entrée, bread, soup, salad, vegetable, potato, and dessert. • Soups - choose one • Vegetable - choose one • Potato - choose one • Single Plated Entrees - choose one • Dessert - choose one ice cream flavor. Please visit our website for complete menu details. I been doing business with Mr. George the owner of this banquet hall as well as the Crystal Sky Banquet Hall in McCook, IL, for over 20 years. All the staffs has great friendly manors. The food is off the chain - its great and the price is reasonable. I try to go to other places, but I find myself back to Mr. George. Every guest I invited here fall in love with Mr. George and his staffs as well as this place. I would recommend this place to anyone who enjoy good services, great food at a reasonable price.